In the video above you can see Silvestre running on a 8.44m long track. Whenever he crosses the mark, sends the lap time over the Bluetooth link to a PC software which displays the timing information along with some other data such as battery level. In the best lap in the video he can reach up to 2.24m/s and as long as the wheels become dirty, the grip decreases and therefore, the times get worse. The microcontroler's got 512KB the flash. Half of this memory's currently holding a custom filesystem to store configuration profiles (speed, PID constants, enabling/disabling features, etc.) which can be loaded, stored and deleted through the PC software. 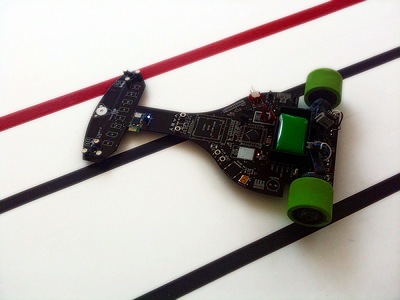 The inertial sensors help Silvestre to measure how good he's performing and enables him to adjust the speed and PID constants as the wheels are losing grip. Basically, the accelerometer data is used to accelerate faster to the setpoint speed whereas the gyro tells him whether he starts drifting (too much angular acceleration). In the contests being held in Spain, there are no marks indicating when a lap has started so there's no way for the robot to figure out when to modify its parameters so something that might be useful as well with the gyro data is to be aware of the actual orientation of the robot. Thus, integrating the gyro signal, Silvestre knows when he is facing the initial position again and this is likely the starting point. However, this approach is not valid when the track's got two or more straights in the same direction because the robot will get to 360º and the lap's not been completed yet. The key for improving Silvestre's performance has been undoubtely the ability to gather data from the sensors in real-time so that they can be later analysed on a computer. My friend Alberto Calvo and me have worked hard on this robot and we're looking forward for new contests and challenges. Our main goal, rather than just following a line, was researching how the usage of inertial sensors and self-learning processes could be applied on this kind of robots. We're still working on Silvestre in our spare times so I'll probably update this post soon.